Medina’s Ryleigh Culver is well on his way to becoming the next “young phenom” on the Genesee Region USBC bowling scene. The 10-year-old right-hander placed first in the Boys U12 division at the New York State Region 2 Pepsi USBC Youth Championships last weekend at AMF Dewey Garden Lanes in Rochester, and now will head to King Pin Lanes in Rome on May 19 to compete for a state title. Ryleigh posted games of 262, 201 and 210 for a 673 series to top the list of 32 boys who participated in his division. He had it going right from the start, rolling the first eight strikes in the opening game. “He’s been practicing a lot and we work with him on his game,” said his dad, Richard Culver II, noting that Ryleigh’s grandfather, Rich, also is a big part of Ryleigh’s success. The practice definitely is paying off as Ryleigh has upped his average to 176, a remarkable number for a 10-year-old. Several other area youngsters fared well at the tournament. Batavian Jacey Wagner, daughter of standout bowler Rich Wagner, placed second in the Girls U8 division to earn a scholarship. In Girls U12, Lorelei Sanders of Medina and Allie Faryna of Perry placed third and fourth, respectively, while in the Boys U20 division, Dennis Van Duser of Perry placed 11th with a 664 series and Trevor O’Dell of Oakfield was 13th with a 654 series. The Pepsi Youth tournament is a totally scratch event (no handicap) with the top two in the U8 and U10 divisions winning scholarships at the regional level, and the top two in the U12, U15 and U20 divisions moving on to the state finals where they will compete for seven scholarships in each of the categories. Batavian Ron Lawrence, bowling in his first 60-and-Over Tour event, took top honors on April 8 at Oak Orchard Bowl in Albion, defeating veteran Fran Bax of Niagara Falls, 226-223, in the championship match. “I surprised myself, that’s for sure,” said Lawrence, speaking with a sense of amazement that he was able to come through in the clutch to knock off Bax, one of the area’s most prolific bowlers over the past five decades. Lawrence, needing two strikes and eight pins in the 10th frame to win the match, packed the 1-3 pocket for three straight strikes to claim the $325 first prize. He said that he believed an open frame in the eighth frame was going to cost him. “I missed the 4-pin in the eighth frame and I thought it would beat me for sure,” he said. Lawrence, a longtime groundskeeper and maintenance man at Stafford Country Club, has had recent success at Oak Orchard Bowl. Earlier this season, he was part of the winning team in a no-tap tournament there. A 195 average bowler, Lawrence competes in the North Pole League at Mancuso Bowling Center and is a substitute in a league at Le Roy Legion Lanes. Lawrence qualified sixth with 642 (the top 10 scores plus six age group leaders advanced), and then registered 219 and 246 to make it to the four-man step-ladder finals. Forty-seven bowlers entered the tournament, which featured step-ladder finals for the first time in its three-year existence. And the final round didn’t lack for excitement, either, as all three matches were decided in the 10th frame. In the opener, John Danielewicz of Sanborn nipped Charlie Gfeller of Rochester, 226-225. After that, Lawrence defeated Danielewicz, 204-196, to set up the title match against the top-seeded Bax. Bax won $200 for his runner-up finish while Danielewicz pocketed $175 and Gfeller $150. Bill Logan of Albion rolled his first USBC-certified 300 game in the last game of qualifying to post a 683 series, which was second behind North Tonawanda’s Dennis Illig, who fired 718. Two other Genesee Region members joined Logan as “cashers” – Bob Hodgson of Medina and Kevin Gray Sr. of Honeoye Falls. The next 60-and-Over Tour stop is at Medina Lanes on April 29. Check-in is at 11 a.m. and competition begins at noon. For more information, contact Tommy Kress at [email protected] or 585-739-3097. Ryan Naylor of Perry and Jason Quilliam of Batavia recorded 300 games in league action last week at Perry Bowling Center and Mancuso Bowling Center, respectively. It was Naylor’s first USBC-certified perfect game and Quilliam’s second. Naylor reached perfection in the second game of the Thursday Night League, and finished with a 645 series. The 24-year-old righty averages about 200 in three leagues at Perry Bowling Center. Recalling the 10th frame, Naylor said he wasn’t too nervous and felt more confident after getting the first strike on lanes 1-2. A member of the Carpenter’s Union Local 276, Naylor said he was used a Storm Code Black bowling ball drilled by Brian Weber to eclipse his previous high game of 279. Quilliam, a 38-year-old right-hander, posted his 300 in the first game of a 714 series in the Antique World Tuesday Coed League. His previous perfect game came in December 2011 and he bowled an 805 series in November 2016. At the USBC Open Championships in Syracuse, Quilliam was part of the Rich Wagner Team that put up a 2,678 three-game series – not a bad score considering the brutally-tough lane conditions. Team members Nate Wright and Rich Wagner had 632 and 706 series, respectively, in the Singles event. -- Medina Lanes is hosting a five-person Baker-style handicap tournament this Sunday, with $1,000 guaranteed for first place and $500 guaranteed for second place. Squad times are at 10 a.m. and 2 p.m. Competition consists of 10 Baker-style games (bowlers alternate frames), followed by match play finals. The entry fee is $125 per team. Handicap is based on 90 percent of the difference in the team average and 1,050, with 1,050 being the maximum. -- A “job well done” goes out to Joe Czworka, who is retiring after 33 years as a league secretary. Joe said he is stepping down after closing the books on the Antique World Tuesday Coed League at Mancuso Bowling Center. -- The Genesee Region USBC announced that prize checks from its association tournament will be going out early next week. More than $6,600 in prize money will be going out to 73 cashers in the Team, Doubles, Singles and All-Events competition. GRUSBC President Tom Fluker also reminds all league secretaries to submit their final average sheets to the association office at 55 Edgewood Drive, Batavia, NY 14020 as soon as possible, and to make their reservations by May 1st for the Annual Meeting and Hall of Fame Dinner on May 12 at Batavia Downs. Genesee Region USBC bowlers were in the groove and then some last weekend at Livingston Lanes in Geneseo and Mount Morris Lanes for Doubles & Singles and Team competition, respectively, at the 12th annual GRUSBC Association Tournament. Batavian Mike Johnson (photo at left) led the hit parade with a trio of prolific three-game series en route to winning the Open Division All-Events crown. The 50-year-old left-hander, who entered with a 226 average, rolled 763 in the Team event, 802 in Doubles and 706 in Singles for a 2,271 (all scratch) score. His 802 in Doubles, which was capped by a 299 game, and his partner Matt Balduf’s 704 series (also all scratch) resulted in a tournament-best 1,506 total. In All-Events, Aaron Verheyn of Medina placed second at 2,210 and Scott Gibson of Oakfield was third at 2,113. In Open Team action at Mount Morris Lanes, the Dinger Stingers squad out of Perry Bowling Center erupted for a 3,513 score with handicap – 3,200 scratch – on Saturday as Nathan Tackentien posted 743, Curtis Hoffman 711, Ryan Wetmore 641, Doug Stratton 615 and Jamie Schery 490. Their score was 149 pins more than the 3,364 posted on Sunday by the Hello team, also out of Perry, consisting of Chris Huntz (699), Stratton (618), Rachel Van Duser (565), John Huntz (554) and Ben Jaggard (545). Recipe for Disaster (Mancuso Bowling Center), captained by Batavian Tom Fluker, and Barber's Five (Mancuso's), captained by Batavian Gerry Barber, finished third and fourth at 3,358 and 3,336, respectively. In Women's Team play, King & Her Court (Mount Morris Lanes), consisting of Jan King, Christine Bovee, Cathi Fournier and Karen Henry, held on to the top spot with 2,444. Hawks (Medina Lanes), captained by Jackie Jurinich, placed second at 2,408, and Appleby's (Perry Bowling Center), captained by Caroline Appleby, took third at 2,345. In Singles competition, Bergen’s Laurie Morgante and Medina's Hayden Allis placed 1-2 with superb scores. Morgante (174 average) rolled 254-211-259 for 724, her first 700 series. With handicap, her total was 834, which edged Allis – who recorded 279-264-279—822. Also in Singles, Attica’s Josh Elliott posted a 300 game, the tournament’s only perfect game. Roxanne Clar of Avon posted 652 with handicap to edge teammate Dawn Johnston of Livonia (632) and Fournier and Jeanne Rosa of Perry (628 each) in Women's Singles. In Women's Doubles, the mother-daughter duo of Joann and Rachel Van Duser (Perry Bowling Center) placed first with 1,281 with handicap – 30 pins more than previous leaders Cathi Fournier and Karen Henry (Mount Morris Lanes) and 40 pins more than Dawn Bertrand and Bonnie Wass (Perry Bowling Center). Fournier paced the Women's All-Events with 1,996, followed by Rachel Van Duser at 1,875 and Wass at 1,854. All scores are unofficial pending final average verification. The Genesee Region USBC has 30 days to pay the prize list, unless extended by USBC headquarters in Arlington, Texas, due to average verification issues. The Genesee Region USBC added $600 to the prize fund. Matt Lewis of Hamilton, Ontario, Canada, makes sure his passport is always current as he makes frequent weekend trips across the border to compete in bowling tournaments in the States. He found his way to Batavia on March 17, and left there $1,000 richer after winning the T.F. Brown’s Scratch Eliminator at Mancuso Bowling Center. In the four-person finals, Lewis shot 226 to defeat Sam Capizzi of Rochester (215), Pat Brick of Buffalo (186) and Kristina Szczerbinski of North Tonawanda (154). The insurance adjuster by trade, Lewis said it was his first tournament title after “numerous” second- and third-place finishes. Capizzi earned $600, Brick $400 and Szczerbinski $300. Two local bowlers cashed for $200 apiece – Rich Wagner of Batavia and Joe Trigilio of Attica. The tournament drew 60 entries. Photo -- Mark Brown, left, tournament director, presents first-place prize money to Matt Lewis. Batavia veteran kegler Fred Gravanda notched a second-place finish on March 18 at the 60-and-Over Tour event at Brockport Bowl. Gravanda rolled a 219 game in the three-man finals, losing out to Steve Nowicki of Rochester (236) but edging Mike Feola of Rochester by a pin. Bob Hodgson of Medina also cashed. The tournament attracted 57 entries, the most ever for one of the monthly competitions run by Hilton’s Tommy Kress. Oak Orchard Bowl in Albion will be hosting the next stop at noon April 8 and Medina Lanes will host a tournament on April 29. Randy Hanks, proprietor of Oak Orchard Bowl, is contributing $350 to the prize fund. The 6th annual Mark Wengrzycki Memorial 3-Person No-Tap Tournament is scheduled for Saturday at Medina Lanes. Squad times are 2, 4 and 6 p.m. with one in six teams cashing, based on three-game totals with handicap. Handicap is based on 80 percent of 220, with a maximum team average of 660. First place is listed as $750. The entry fee is $75 per team. The Rose Garden I team of Bergen is 16 points ahead with just one week remaining in the Genesee Region Youth Travel League. The league concludes its regular season on April 15 at Oak Orchard Bowl in Albion with a position round, meaning that Rose Garden I will take on Perry Bowling Center needed to win just two of the 19 points up for grabs. In recent action at Mancuso Bowling Center, Perry topped Rose Garden I, 13-6, to keep its hopes alive. Individually, James Townsend (Batavia Strike Force) led the boys with a 240 game and 614 series, while Corinne Saluste (Batavia Strike Force) paced the girls with a 215 game and 550 series. The league concludes with a no-tap tournament and banquet on April 22 at Mancuso’s. Contact Tom Fluker at [email protected] for more details. The GRUSBC Association Banquet & Hall of Fame Dinner is slated for 6:30 p.m. May 12 at Batavia Downs Gaming on Park Road. Tournament champions, scholarship winners and Hall of Fame inductees will be honored, and a report of the 2017-18 season will be given by association officials. -- GRUSBC directors, the Hall of Fame inductee and one guest, Adult tournament champions (limit one tournament only), Youth tournament champions and one guest (limit one tournament only) and scholarship recipients and one guest are invited at no charge. -- Past GRUSBC Hall of Famers, league secretaries or representatives (limit one per league) are invited at half price. The deadline for reservations is May 1. For reservations, send an email to [email protected]. Our condolences are extended to the families of three valued members of the area’s bowling community who passed away in recent days. Carmen DiFilippo of Batavia was a former Classic League bowler at Mancuso Bowling Center and the longtime secretary of the Polish Falcons League on Wednesday night. He died on March 22 at the age of 80. M. Carol Lowe of Oakfield died on March 18, at the age of 80. Carol was a fine bowler and served as a Genesee Valley Women’s Bowling Association director for many years. 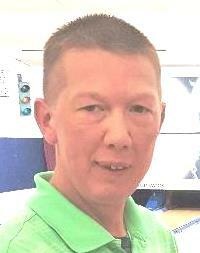 Steven Durfee of Bennington was a regular bowler (along with his wife, Mary Jean) at Bennington Lanes. He passed away on March 18 at the age of 64. Teams representing Mancuso Bowling Center and Mount Morris Lanes are in first place in the Open and Women's Team divisions, respectively, after the first of two weekends of the 12th annual Genesee Region USBC Association Tournament at Mount Morris Lanes (Team event) and Livingston Lanes in Geneseo (Doubles & Singles events). Go to www.bowlgr.com for for unofficial standings through Sunday, March 18. Competition resumes on Friday and there are plenty of openings for both Team and Doubles/Singles events. To enter, contact Mike Pettinella, GRUSBC association manager, at 585-861-0404 or at [email protected]. In the Open Team event, Barber's Five (Mancuso's) leads the way with 3,336, followed by Medina Lanes at 3,204. Gerry Barber paced his team with 673 scratch while Aaron Verheyn posted 731 and Ray Neuman 712 for the Medina squad. In the Women's Team event, King & Her Court is in first place with 2,444 (four person team) and Hawks (Medina Lanes) are in second at 2,408. Karen Henry's 548 series led the King & Her Court team, captained by Jan King. Open Doubles -- Mike Cunningham and Chris Huntz (Perry Bowling Center), 1,343; John Wolff and Ron Lawrence (Mancuso's), 1,335. Women's Doubles -- Cathi Fournier and Karen Henry (Mount Morris Lanes), 1,251. Open Singles - John Wolff, 744; Chuck Bobo (Mancuso's), 678. Women's Singles -- Cathi Fournier, 628. Open All-Events -- Gregg Wolff (Mancuso's), 1,943; Casey Palmer Sr., 1,935. Women's All-Events -- Cathi Fournier, 1,996. Competition will take place in three divisions -- Open (men and women), Women and Scratch (men and women). In the Open and Scratch divisions, teams are comprised of five players; in the Women's division, teams consist of four players. Handicap is set at 90 percent of 215 in the Open and 90 percent of 200 in the Women's. Entry fees are $25 per person per event and $10 for optional All-Events. Batavian Jim Pursel enjoyed a profitable weekend, teaming with Oakfield resident Robin Blaun to capture the T.F. Brown’s King & Queen mixed doubles handicap tournament at Mancuso Bowling Center on Saturday and then joining forces with nine fellow league bowlers to cash twice at the Bob Bertram Memorial handicap no-tap tournament at Mount Morris Lanes on Sunday. At the King & Queen event, Pursel and Blaun outlasted 62 other couples – defeating Curtis Foss of Medina and Brianna Larson of North Tonawanda, 492-483, in the title match – to pocket the $500 top prize. "Robin was phenomenal ... she carried us," said Pursel, crediting Blaun for averaging 185 for the tournament -- 22 pins over her average. But Pursel was being humble in his assessment as he put up high scores all day, including a 269 in the championship match. "It was fun in the final game, bowling against Curits and his partner and matching him bomb for bomb," he said. Blaun chipped in with 189 and, with their 34 pins handicap, edged Foss and Larson, who posted 258 and 225, respectively. Pursel and Blaun registered 1,316 in the three-game qualifier to finish in the seventh position. The top 16 teams advanced to match play, led by Mark Brown of Attica and Traci Spanitz of Rochester, who had 1,432. Foss and Larson were the second-high qualifiers with 1,415. In match play, Pursel and Blaun posted victories over Naomi and Mickey Hyde of Le Roy (with Blaun posting a 226 game), Kai Clark and Mary Jo Brenner of Rochester (with Pursel rolling 266), and Steve Dorobiala and Holly Johnson of Buffalo, before facing Foss and Larson. Foss and Larson split $300 for placing second, while Dorobiala and Johnson, and Mario and Kara Mangiola of Rochester each split $200 for finishing third/fourth. Other local cashers were Fred Gravanda of Batavia (with Sarah Germano of Rochester), Chris Bardol and Caycee Landers of Brockport, Mike and Heather Johnson of Batavia, Dean Cadieux Jr. and Kristin Thompson of Oakfield, and Rich Wagner of Batavia and Darleen Balduf of Byron. At the 19th annual Bob Bertram Memorial, the Pursel group comprised of members of the North Pole League on Thursday nights at Mancuso’s formed two teams, with each bowling twice, and walked away with the $1,000 first prize and $300 third prize. Members of the first-place team were Mike Johnson, Tom Baker, Matt Balduf, Mark Brown and Denny Rogers, and members of the third-place team were Joe Trigilio, Rob Stefani, Jason Quilliam, Mike Lambert and Pursel. While none of the eight Genesee Region bowlers advanced to the match play portion of the NYS Masters Championship on March 3 at Allie Brandt Lanes in Lockport, all of them deserve credit for taking on the challenging Sport lane condition and battling against the best of the best in New York State. Medina residents Curtis Foss and Scott Allis were stopped by one sub-par game out of their five qualifying games, each missing the cut on the first squad by about 50 pins. On the second squad, Gray Jr. also was thwarted by one low game and missed the cut by just 30 pins. To illustrate the oil pattern’s difficulty, it took a score of 966 – a 193 average -- on the second squad (out of 71 bowlers) to advance. Also competing in the tournament were Jim Foss and Aaron Verheyn of Medina, Kevin Gray Sr. of Honeoye Falls, Jared Allen of Oakfield and Frank Jarkiewicz of Byron. Kristina Szczerbinski of North Tonawanda became the first woman NYS Masters champion, defeating PBA standout Brad Angelo of Lockport in the final match for the $2,000 first prize. 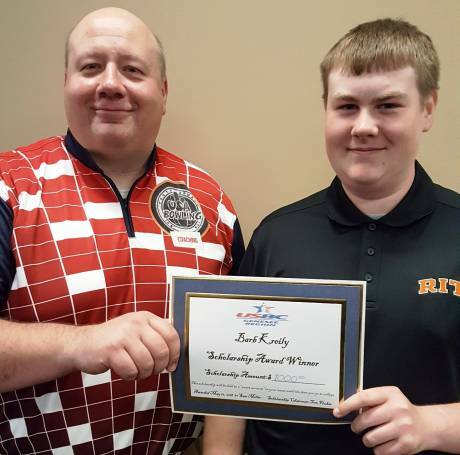 Dennis Van Duser and Matt Hurlburt of Perry Bowling Center combined for a 1,350 score with handicap to each win $100 scholarships and trophies at the GRUSBC Association Youth Doubles Tournament at Scopano's Lanes in Oakfield last weekend. The winning duo in Division A topped second-place Ryleigh Culver and Ethan Cramer of Medina Lanes by 115 pins. 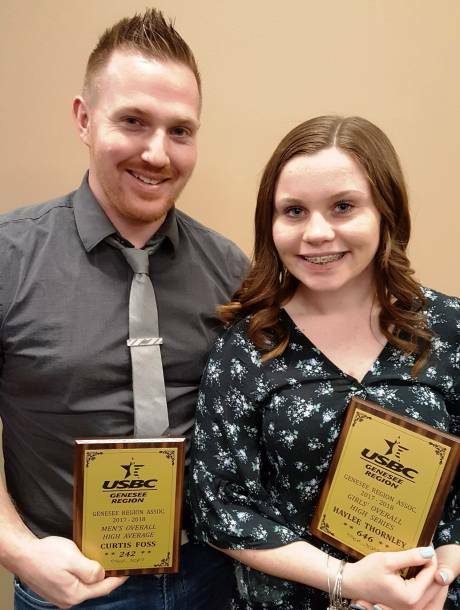 Culver and Cramer and third-place Aaron Leone and Samantha Hyde of Le Roy Legion Lanes also won trophies. In Division B, Brad June and Alexis Patterson of Mount Morris Lanes placed first with 1,314 (winning $100 scholarships and trophies), while Paige Snook and Matt Baker of Albion, and Brooke Jurek and Van Duser of Perry placed second and third, respectively. In Division C, Brendan Pimm and Megan Jarkiewicz of Bergen took first with 1,261 (winning $100 scholarships and trophies), and were followed by Dominic LaPiana and Hanna McKenzie of Mount Morris, and Josh and Tony Sprague of Batavia. The Rose Garden I team upended Batavia Strike Force, 13-6, last week at Scopano’s Lanes in Oakfield to move comfortably ahead with two weeks remaining in the Genesee Region Youth Travel League. The team of Devon Zinter, Madelynn Pimm, Brooke Jarkiewicz and Michael Sardou is 19.5 points up on Oak Orchard I and Batavia X-Factor with only sessions on March 25 at Mancuso Bowling Center and April 8 (position round) at Oak Orchard Bowl in Albion. Individually, Dennis Van Duser of Perry led the boys with a 279 game and 660 series, while Haylee Thornley of Batavia X-Factor paced the girls with a 237 game and 554 series. Other high series were by Matt Hurlburt of Perry, 654; Tony Sprague of Batavia X-Factor, 607; Samantha Hyde of Le Roy, 544, and Paige Snook of Oak Orchard I, 522. More than 1,000 entrants tried their hand at the weeklong Super Bud Bowl at Lighthouse Lanes in Oswego last week and, when the smoke had cleared, Rochester left-hander Dan Vick – arguably the best bowler in the Flower City – drove home with the $5,500 first place check. Vick, 31, defeated high qualifier Art Oliver Jr., 219-213, in the championship match. He did so in dramatic style, coming through with three strikes in the 10th frame to overtake the Hamilton, Ontario, Canada lefty, who had doubled in the 10th to put the pressure on Vick. Oliver earned $2,800 for placing second. Two Perry residents cashed on the extremely tough Sport condition: Matt Slocum, who rolled 821 for his four games and Brett Van Duser, who recorded 798. Entries are being accepted for the 12th annual Genesee Region USBC Association Tournament taking place at Mount Morris Lanes (Team event) and Livingston Lanes in Geneseo (Doubles & Singles events) over the next two weekends. -- Sunday, Rick Daniels, Gary Gilman, Terry Gilman, Linda Johnson, Reid Cole, Jeff Say. The tournament features three divisions -- Open (men and women), Scratch (men and women) and Women. In the Open and Scratch divisions, teams are comprised of five players; in the Women's division, teams consist of four players. To sign up, call 585-861-0404 or send an email to [email protected]. Entry forms can be downloaded at www.bowlgr.com. Two teams of Batavia-area bowlers are competing in the USBC Championships at the end of the month at the Oncenter in Syracuse. Team members are Paul Spiotta, Gregg Wolff, Joe Mortellaro, Todd Mortellaro, and Joe Trigilio on one squad and Brian Green, Fred Gravanda, Geoff Harloff, Mark Brown, and Jim Pursel on the companion squad. Their Team event is scheduled for 7 p.m. March 29 and their Doubles & Singles are set for 2 p.m. March 30. By the way, this will be the 25th ABC/USBC Open Championships for Trigilio, a worthy accomplishment, and the 49th ABC/USBC Open Championships for Mortellaro, who is just one year away from a milestone that not many bowlers achieve. The bowlers spoke and the Genesee Region USBC directors listened. And, as a result, the 12th annual GRUSB Association Tournament later this month includes a Scratch Division and a handicap base of 215 – down from 230. Now, let’s see if the changes pay off in increased entries for the tournament, which is scheduled for March 16-18, 23-25 at Mount Morris Lanes (Team event) and Livingston Lanes in Geneseo (Doubles & Singles events). Competition will take place in three divisions -- Open (men and women), Scratch (men and women) and Women. In the Open and Scratch divisions, teams are comprised of five players; in the Women's division, teams consist of four players. Last year, the handicap base was at 230, and that drew complaints from the higher average bowlers who felt they were at a competitive disadvantage. GRUSBC directors took that into consideration in lowering the base to 215 – and also brought back a Scratch division for those bowlers wishing to compete against other teams without handicap. As of Wednesday, all squads are open except for the Team squad at 11 a.m. on March 18. The maximum number of team entries is 80. A chart showing the current entries can be found at www.bowlgr.com. To reserve your spot, call 585-861-0404 or send an email to [email protected]. Teams from Le Roy and Perry captured divisional titles at the GRUSBC Association Youth Team Tournament at Le Roy Legion Lanes. In Division A, the Le Roy team of Trey Prevost, Tyler Klein, Aaron Leone and Samantha Hyde place first with a 2,531 score -- 90 pins better than the Medina team of Lorelei Sanders, Graceland Mahnke, Juliana Allis and Ryleigh Culver. Ryan Bigsby, Tony Sprague, Sam Miller and James Townsend of Mancuso Bowlling Center placed third with 2,412. In Division B, the Perry squad of Gavin Slocum, Brooke Jurek, Dennis Van Duser and Matt Hurlburt finished on top with 2,536 -- 90 pins better than the Mount Morris team of Alexis Patterson, Britney Rathburn, Brad June and Trenton Willis. Kyle Regatuso, Ava Tortorice, Hannah McKenzie and Isabel Laney of Mount Morris Lanes placed third with 2,426. Members of the first-place teams in both divisions earned $100 scholarships each, while the top three teams in both groups received trophies. The 60-and-Over Senior Tour will be making a swing into Orleans County for a pair of tournaments in April. Oak Orchard Bowl in Albion will host the tour’s seventh event of the season on April 8 and Medina Lanes will host tournament No. 8 on April 29. Check-in for both competitions is at 11 a.m. with bowling starting at noon. According to tour director Tommy Kress, Oak Orchard Bowl proprietor Randy Hanks is putting money into the prize fund, which means that with 42 bowlers, the top prize will be $350. The next 60-and-Over event is set for March 18 at Brockport Bowl with check-in at 11 a.m. and bowling at noon. For the second straight Professional Bowlers Association tournament, the victor won all four stepladder matches en route to the title. Last Sunday, Tom Smallwood of Saginaw, Mich., defeated defending champion Jason Belmonte of Australia, 259-239, for the $40,000 first prize at the Barbasol PBA Players Championship in Columbus, Ohio, thwarting Belmonte’s bid for a record-tying 10th major championship. To reach the final match, Smallwood downed Canadian Patrick Girard, 237-206, before edging Kris Prather of Plainfield, Ill., 236-235, and Marshall Kent of Yakima, Wash., 225-224. Belmonte earned $20,000 while Kent took home $12,000, Prather $11,000 and Girard $10,000. On Feb. 11, Matt O’Grady of Rahway, N.J., won the PBA Tournament of Champions on by sweeping all four finals matches. The PBA returns to ESPN at 2 p.m. Sunday with the finals of the Mark Roth/Marshall Holman PBA Doubles Championship. Live coverage of the USBC Masters is scheduled for 1 p.m. April 15 on ESPN. Continuing their dominance of the tournament, Mickey Hyde and Tom Rohl joined forces with fellow LeRoyans Shayne Herold and John Lowe to win the Ron Riggi Memorial at Le Roy Legion Lanes. The winners totaled 3,642 for three games to run away with the tournament by 117 pins over second-place Kevin Bienko, Dan Streer, Josh Shoemaker and Dana Voytovich of the Buffalo area. First place was worth $900 while second place paid $450. Hyde and Rohl also cashed with other teams, with Hyde placing third with Rob Sease, Norm Bialuski and Ryan Kretchmer, and Rohl placing fourth with Mark Brown, Matt Balduf and Scott Culp. Herold won the singles event with a 968 score, good for $120. The Rose Garden I team of Bergen defeated Batavia Bombers, 13-6, at Mount Morris Lanes on Feb. 18 and now holds a 15-point lead over second-place Perry Bowling Center with four sessions remaining in the Genesee Region Youth Travel League. Perry pulled into second by virtue of a 16.5-2.5 win over Batavia Strike Force, which dropped to third, tied with Batavia Thunder and three points behind Perry. Individually, Matt Hurlburt of Perry led the way with a 245 game and 670 series while teammate Dennis Van Duser had 236 and Strike Force’s Skylar Laesser 233. Paige Snook of Oak Orchard Bowl led the girls with 209—532. The league bowls this Sunday at Perry Bowling Center with the first shift at 12:30 p.m. Entries are picking up for the 28th NYS Masters Championship this Saturday at Allie Brandt Lanes in Lockport. Qualifying squad times (five games) are at 9 a.m. and 12:30 p.m., with one in five bowlers advancing from each squad to the head-to-head match play finals. First place is $2,500 and a free entry to the 2019 USBC Masters. Genesee Region bowlers currently signed up are Curtis Foss of Medina at 9 a.m., and Jim Foss of Medina, Kevin Gray Sr. of Honeoye Falls, Kevin Gray Jr. of Warsaw, Aaron Verheyn of Medina and Frank Jarkiewicz of Byron at 12:30 p.m.
For more information and a tournament roster, go to www.bowlny.com. On Saturday, March 10, Mancuso Bowling Center is hosting its annual King & Queen Mixed Doubles Handicap Tournament, with squad times at noon and 2 p.m. Call 585-343-1319 for more information. In competitive bowling, the mental game plays as important a role in the road to success as the physical game. It took some time – and a few cases of “letting your emotions get the best of you” – for Warsaw’s Kevin Gray Jr. to grasp this but now that he has, the 36-year-old left-hander has become a force to be reckoned with on a regular basis. 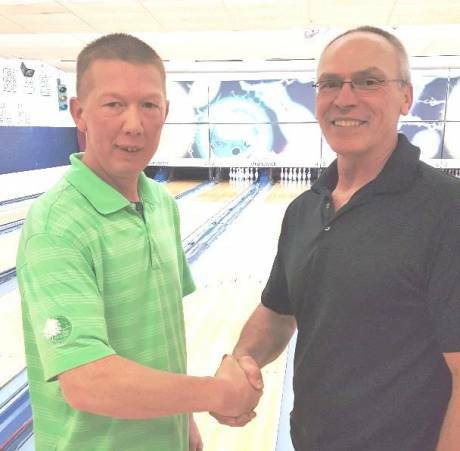 Gray shook off a couple errant shots during Sunday’s Peterson Point match play finals of the Genesee Region USBC Masters tournament at Livingston Lanes in Geneseo and came through in the clutch to unseat defending champion and fellow lefty Rich Wagner of Batavia. A 213-204 victory in the position round secured the title for Gray, who took the lead after game four of the eight-game final round and held on to win the $300 first prize and Masters’ champion ring. Gray entered the last game with a 44-point advantage over Wagner (bowlers receive 30 points for each match victory and plus or minus pins based on their score in relation to 200), which meant he needed to beat Wagner for the crown. Wagner, on the other hand, needed to defeat Gray by at least 15 pins to win the tournament. An open frame by Gray to start the game, coupled by a double by Wagner put the Batavian in the lead temporarily, but Gray responded with four strikes in a row to pull even. After another open in the seventh, Gray once again bounced back with strikes in the ninth and 10th frame to lock up the match. Gray, a team leader of the medicine access center at the University of Rochester, was a model of consistency throughout the tournament – qualifying in the third position with 888 for four games and grabbing the fourth spot among the final eight bowlers with 886 on Saturday for a 222 average. And he kept that average on Sunday en route to winning seven of his eight matches. Gray said he dedicated the victory to his late grandfather, Lester Gray, who would have been 102 on Sunday. Wagner, who picked up $250 for placing second, had the high average for the tournament – 227 – largely due to a 1,024 four-game score (256 average) in the four-game semifinals that propelled him to the No. 1 berth on Sunday. Brian Green, another Batavia southpaw and the high qualifier with 956, finished third and earned $200. He was followed by three-time Masters champion Fred Gravanda of Batavia ($150), Chris Bardol of Brockport ($100), lefty Mike Johnson of Batavia ($100), Scott Culp of Lima ($90) and Brady Weber of Perry ($90). Other cashers (in ninth through 16th place) were Jim Pursel of Batavia, Matt Balduf of South Byron, Dean Cadieux Jr. of Oakfield, Geoff Harloff of Batavia, Dana Nowack of Livonia, Joe Trigilio of Attica, Paul Spiotta of Batavia and Josh Elliott of Attica. The tournament drew 45 entries. For qualifying, semifinal and match play results, go to www.bowlgr.com. Photo at top -- Tournament director Paul Spiotta congratulates Kevin Gray Jr., center, and Rich Wagner, who placed first and second, respectively, at the GRUSBC Masters. Photo by Mike Pettinella. Whether you’re talking about her bowling scores, the winter weather or a bowling ball company, former collegiate standout Caycee Landers has taken Western New York by "storm." Landers, a 27-year-old right-hander, migrated from Los Angeles about a year ago, and joined the G&W Vending League at Rose Garden Bowl in Bergen at the invitation of her boyfriend, Chris Bardol of Brockport. Since then, she has bowled several 700 series, with her latest – a 782 effort on Tuesday night -- breaking the Genesee Region USBC record of 762 previously held by Bardol’s sister, Jennifer. Landers, using a Roto-Grip Wreck Em ball (manufactured by Storm), posted games of 267-246-269, and raised her league average to 225. This comes on the heels of her victory on Feb. 3 at the Rochester NY USBC Queens Tournament at AMF Gates Lanes, where she defeated two of Rochester’s best, Tara Mangiola and Shanna Chepelsky, in the finals. Landers has been so good on the lanes lately that it has made the WNY cold weather a bit more tolerable. Landers was an Academic All-American while bowling at Newman University in Wichita, Kan., and previously she bowled at Wichita State. She said that she met Bardol at the Team USA Trials in 2008. Landers has multiple 300 games and a high series of 837. She thought she should have had another 800 on Tuesday night. Her 782 fell nine pins short of the Rose Garden Bowl women’s record of 791 set by Mangiola in the Triple O Mechanical Tournament (a non-GRUSBC event). She did fare better than Bardol, however, who rolled a 694 series on his 30th birthday. 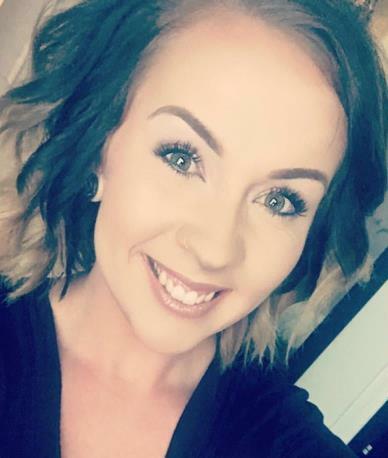 Landers said she is considering bowling in the New York State Queens Championship on April 21 in Newburgh, a tournament that has been won by another former Wichita State bowler, Shannon Sellens of Long Island, for the past four years. -- Livingston Lanes owner Marty Estruch, a Mount Morris resident who owns a few hotels in that area, said he is looking for someone to manage the 16-lane bowling center and bar. The managerial position will be open at the end of this month, Estruch said, adding that the ideal candidate will have knowledge of the business of bowling, customer service skills and an ability to build programs to increase traffic. Until then, John LaGeorge will be handling day-to-day duties. -- The brother-sister team of Mike and Shelly Schepis of Medina won the Love ‘Em & Hate ‘Em mixed doubles handicap tournament at Medina Lanes over the weekend. They were followed by Marion Singleton of Lockport and Brian Cline of Williamsville, Rob Stefani of Batavia and Sarah Cassidy of Albion, and Jenelle and Rusty Boyd of Lyndonville. -- Right-hander Matt O’Grady of Rahway, N.J., mowed down a couple heavyweight two-handers on Sunday to win the 53rd PBA Tournament of Champions for his first PBA Tour title. 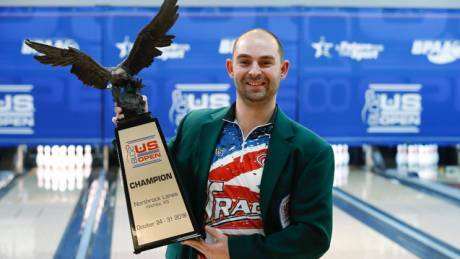 O’Grady, 31, whose best previous PBA Tour finish was fourth, won four stepladder finals matches at AMF Riviera Lanes in Fairlawn, Ohio, including victories over PBA Player of the Year Jason Belmonte of Australia and Jesper Svensson of Sweden. Final standings: Matt O’Grady, Rahway, N.J., $50,000; Jesper Svensson, Sweden, $25,000; Andrew Anderson, Holly, Mich. $13,000; Jason Belmonte, Australia, $11,000; BJ Moore, Greensburg, Pa., $10,000. Stepladder Results: O’Grady def. Moore, 219-174; O’Grady def. Belmonte, 229-225; O’Grady def. Anderson, 194-185; O’Grady def. Svensson, 207-193. -- Legion Lanes in Le Roy will be hosting the 16th annual Ron Riggi Memorial 4-Person Handicap Tournament on Feb. 23-25, offering a first place prize of $1,000 (based on 40 entries). Squad times are 6:30 p.m. Feb. 23, noon and 3 p.m. Feb. 24 and noon and 3 p.m. Feb. 25. The entry fee is $100 per team. To enter, contact Mark Brown at 716-474-7960. -- Three of the five Batavia teams in the Genesee Region Youth Travel League are within striking distance of first-place Rose Garden Bowl I after nine weeks of the 13-team circuit. Batavia Thunder and Batavia X-Factor gained ground in recent competition at Mancuso Bowling Center in Batavia with victories over Rose Garden I and Batavia Bombers, respectively. Rose Garden continues to lead, however, as it is 7.5 points ahead of Batavia Strike Force, 14.5 in front of Oak Orchard Bowl I and16 points ahead of Batavia Thunder and X-Factor. Individually, James Townsend (Strike Force) topped the list last week with 233—609, while Ben Lennox (Oak Orchard I) had 606 and Sam Miller (Strike Force) posted 603. For the girls, Samantha Hyde (Le Roy) led the way with a 224 game and 560 series, followed by Corinne Saluste (Strike Force) with 537 and Paige Snook (Oak Orchard I) with 514. The league bowls at 12:30 p.m. this Sunday at Mount Morris Lanes. posted by Mike Pettinella in sports, Bowling, United States Bowling Congress. In my Jan. 18 column, I shared information about the reclassification of leagues by the United States Bowling Congress – the national governing body's analysis of bowler averages that could result in a “Standard (or House)” shot league being changed to a “Challenge” or “Sport” league based on data derived from bowlers who participated in multiple leagues during the 2016-17 season. While I support the USBC in its effort to even the playing field when it comes to rating bowlers equal to their skill levels, I am not on board with the way the USBC handled a situation that targeted 704 leagues for possible reclassification. USBC sent letters out of the blue to these leagues, causing a great deal of anger and confusion. This I know because I was copied on the letters from USBC to 39 leagues in New York State (and on several of the appeals from league officials that followed shortly thereafter). What the USBC should have done was to inform its membership as a whole in advance about the process, letting everyone know that it had been studying averages from last season and that if a league had at least 20 percent of its members who bowled in multiple leagues, it could be subject to reclassification. For the record, USBC’s research revealed that 99 leagues were statistically more difficult for bowlers with averages of 20 or more pins higher in a Standard or “house shot” league, which showed that those leagues were competing on “Sport” conditions. It also found 605 leagues in which bowler averages were 10-19 pins higher in Standard leagues, which shows that those leagues were competing on “Challenge” lane conditions. (Bowlers with league averages designated as “Sport” or “Challenge” are indicated as such on bowl.com, and are subject to using the conversion charts when entering leagues or tournaments bowled on “Standard” oil patterns). So, instead of informing bowlers with a message on bowl.com and/or an e-mail blast that this was going to happen and of the appeal process, the USBC blindsided its bowlers (and this is not the first time). Talk about shutting the barn door after the horse has bolted! To date as a result of appeals, the USBC has decided not to change many of the 700 leagues that were targeted. In New York, at least 22 of the 39 leagues identified for reclassification have been kept as "House" leagues. In the future, I would hope that the USBC brain trust would think things through to avoid alienating its membership base, especially considering that a decade-long trend of declining membership continues. Longtime Batavia bowlers Joe Trigilio, Fred Gravanda, Joe Mortellaro and Paul Spiotta teamed to place first, rolling a score of 3,187 to capture the $880 top prize. The event drew 43 teams and raised $1,540 for Genesee Cancer Assistance. Kim Starken, Caycee Landers, Jeanette Sease, Tom Rohl, 2nd, 3,139, $480; Jason Quilliam, Brian Green, Nate Wright, Mike Lambert, 3rd, 3,097, $240; Justin Burdick, Jim Prucha, Jim Kessler, Steve Wenzka, 4th, 3,069, $230. Dennis Rogers, Mark Brown, Rob Sease, Chris Bardol, 5th, 3,061, $220; Jen Wagner, Rich Wagner, Jason Gallo, Tony Gallo, 6th, 3,050, $210; Ron Brown, A.J. Allenbrandt, Heather Johnson, Mike Johnson, 7th, 3,033, $200. Ricky Zinone of Rochester defeated Matt Burt of Buffalo, 192-174, in the title match to win the $1,500 first prize. The 40th annual scratch tournament drew 108 entries. Zinone qualified in the eighth position with 949 for four games. Kevin Donovan of Painted Post was the high qualifier with 1,024. Steve Santini of Mount Morris was the only Genesee Region USBC bowler to make the top 24, qualifying through the one-game, “last chance” squad with a 237. The field included some of the top bowlers in New York State, including professional Ryan Shafer of Horseheads, Mike Rose Jr. of Rochester, Ken Muscato of Canandaigua and Dan Vick of Rochester. The Le Roy team of Mickey Hyde, Naomi Hyde, Tom Rohl and Shayne Herold placed first in the handicap tournament with a 3,266 score, winning $600. They were followed by Mark Brown, Kai Clark, Rob Sease and Norm Bialuski with 3,257, $480; Scott O’Neill, Ian Elliott, Dave Elliott and Bill Van Alst, 3,204, $300, and Tom Fluker, Mike Johnson, Mike Lambert and Nate Wright, 3,105, $200. Proceeds went toward wounded soldiers returning home. The Lockport-area duo of Gary Kinyon and Jason Ciliberto defeated the Batavia-area duo of Matt Balduf and Rich Wagner, 465-395, to win the $700 first prize. Thirty-one teams competed in the tournament, which featured six-game qualifying where bowlers alternate frames. From there, the top eight teams advanced to two-game eliminator style finals where half the field is eliminated in each round. Balduf and Wagner earned $400 for placing second. Other local teams cashing were Batavian Gregg Wolff and Brian Green. Tom Fluker of Batavia and his partner, Lowell Schoonmaker of Florida, combined for a 300 game. -- Livingston Lanes in Geneseo will be hosting the 57th annual Genesee Region USBC Masters Tournament on Feb. 10-11. Open to current GRUSBC members with at least 21 games in a particular league, the tournament offers a first prize of $525 plus a champion’s ring (based on 80 entries). Qualifying squads (four games) are set for 10 a.m and 1 p.m. Feb. 10, with the top 16 advancing to the four-game semifinals at 4 p.m. on Feb. 10. From there, the top eight bowlers (eight-game totals) will move on to the eight-game Peterson Point match play finals at 1 p.m. Feb. 11. The entry fee is $50, and re-entry is allowed provided the re-entry does not prohibit a first-time entrant from competing. -- The 22nd annual Betty Ellison Memorial “Strike Out for Crossroads House” benefit tournament is scheduled for Feb. 16-18 at Mancuso Bowling Center. Squad times for the five-person handicap event are 6 p.m. Feb. 16, 3 and 6 p.m. Feb. 17 and 1 p.m. Feb. 18. As of Wednesday morning, openings remain on all squads except for the 6 p.m. Friday squad. The entry fee is $110 per team until Feb. 9; after that date, it increases to $125. Registration can be done online by going to www.crossroadshouse.com and choosing the Events tab. All proceeds from the bowling as well as numerous raffles over the weekend will go to benefit Crossroads House, a comfort care home serving the residents of Genesee and Wyoming counties who have been medically determined to be in their last stages of life (three months or less). For more information, call 585-409-0136. -- The 12th annual GRUSBC Youth Team Tournament is set for Feb. 17 at Le Roy Legion Lanes, with squads at noon and 3 p.m.
Only a few spots remain as the maximum number of teams in the event is 16. Each team consists of four bowlers. The entry fee is $64 per team. Scholarships will be awarded to the first-place teams in each of three divisions, based on team average. The Genesee Region Youth Travel League returns to Mancuso Bowling Center at 12:30 p.m. this Sunday. Rose Garden Bowl I continues to lead the 13-team league by 4.5 points over Batavia Strike Force, with Oak Orchard Bowl I another 13 points back. 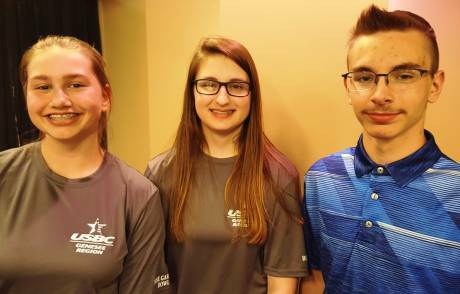 In recent action, Josiah Yantz of Scopano’s Lanes led the way for the boys with a 242 game and 682 series, while Paige Snook of Oak Orchard Bowl I led the girls with a 214 game and 563 series. I'm pleased to welcome a new "Pin Points" sponsor this week – Neo-Tac, Inc., which is owned by scientist and avid bowler, Frank Bernabei of Middleport. Bernabei’s company specializes in bowling ball surface management products, such as Hook-It, Renew-It and Liquid Nitro, as well as lane conditioners and cleaners. Just click on his ad to learn more. And while you’re at it, click on all of the ads on this page and support those businesses that help keep the sport of bowling in the news. Scott Allis of Medina rolled an 806 series and Dave Emler of Rochester posted a 300 game -- his second this month -- to highlight last week's league bowling action in the Genesee Region. Allis had games of 259-270-277 for his eighth USBC-certified 800 series over the past 17 years in the Sunday Rolloffs League at Medina Lanes. Emler's perfect game came in the G&W Vending League at Rose Garden Bowl in Bergen, where he previously shot 300 on Jan. 2. In the County Line Stone League at Scopano's Lanes, Paul Spiotta of Batavia registered a 290 game. For a list of high series and games for the week of Jan. 22, click on the Pin Points tab at the top of this page. Mike Pettinella's next Pin Points column will be posted on Thursday. 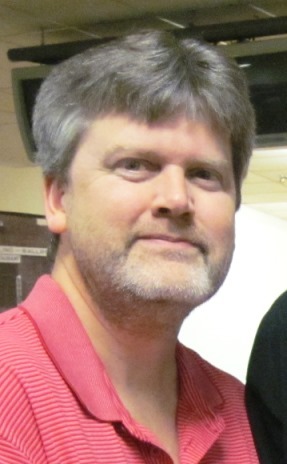 Although he has racked up numerous local, regional and state tournament titles in recent years, Scott Culp of Lima – champion of the Genesee Region USBC Scratch Memorial on Jan. 7 at Letchworth Pines in Portageville – says he prefers to stay in the moment. Culp accomplished just that and more at the Pines by conquering two “Sport” oil patterns – averaging 221 for eight games – before defeating Jerry Blair of Le Roy, 215-180, in the title match to earn the $600 top prize. “I feel that versatility is one of my strengths – being able to play near the gutter on shorter patterns and inside, keeping the ball in a contained area, on long patterns,” he said. He said he learned how to bowl growing up in Honeoye Falls at Brongo Ball, where he developed his unique style of walking from right to left on the approach and utilizing an extra-high backswing. “It sort of came naturally,” he said, pointing out that as a younngster he was enamored with the style of PBA star Pete Weber. Culp, holder of the GRUSBC league average record of 242 for a full season, successfully defended his Scratch Memorial crown with the win over Blair, who had advanced through the step-ladder finals with victories over Brady Weber of Perry, Don Parrott of Warsaw and Kevin Gray Jr. of Warsaw. He receives ample support – and help with getting all of his bowling balls into the center – from Colleen Harrington, his girlfriend of 10 years and teammate on a league at Roseland Bowl in Canandaigua. While the results of the tournament were posted previously by me on The Batavian, I’d like to give a “shout out” to Dean Cadieux Jr. of Oakfield, who advanced to the semifinals despite an opening 117 game in the four-game qualifying round. Cadieux kept his composure, moved his line farther to the right, changed balls and registered 676 for the next three games to take the third and final qualifying spot from his squad. Many others may have hung their heads and gave up after such a tough start, but give credit to Cadieux for figuring it out and, ultimately, earning a check for his efforts. 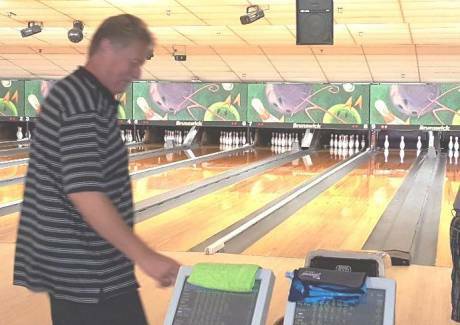 While Batavian Jim Pursel has been a good bowler for many years, he has definitely stepped up his game after reaching that milestone last June. “Jimbo,” as he is affectionately known, is wreaking havoc on the lanes throughout Western New York – posting a 300 game at Mancuso Bowling Center in Batavia in November and a 300 at Transit Lanes in Buffalo in December -- and, most recently, rolling an 827 series in the Storm Bowlers Choice Pro Shop Senior League at Transit Lanes. Pursel’s first 800 series – he has several 300 games – came in the finals of the league’s weekly match play and propelled him to his third victory of the season. His games were 278 and 270, which were rolled on one pair of lanes, and 279, which came in the final match on a different pair of lanes. All told, he had 31 strikes – leaving just 5 10-pins along the way. Pursel is averaging 218 in the league, six pins less than his average in a league at Clarence Bowling Academy on Monday nights. He also substitutes in The North Pole league at Mancuso’s on Thursdays. The 827 eclipses his previous high series of 799, and he also had a 794 back in 2005. 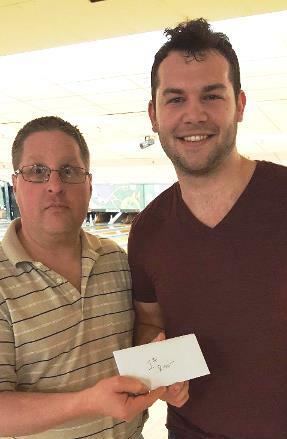 Brian Cline of Williamsville, one of the best left-handers in New York State, set a Genesee Region USBC Association record on Saturday when he posted an 858 series in the Adult-Youth Doubles Tournament at Mancuso’s. Cline, 39, rolled 279-279-300, leaving a 10-pin in the first game and the second game. His effort is 10 pins better than the 848 registered by another lefty, Darrow Rumsey of Batavia, at Scopano’s Lanes in Oakfield in 2000. In league play, Diane Hurlburt of Warsaw overcame a shaky start to roll 11 strikes in a row for a 277 game in the Monday Nite League at Perry Bowling Center this week. Hurlburt, who is averaging a sparkling 207 in the league, started with a 2-8-10 split, and missed them all for 7 pins in the first frame before striking the rest of the way. She finished with a 658 series. Victory in the season-ending World Championship has propelled Australia’s Jason Belmonte to rarified air – recipient of the Chris Schenkel Professional Bowlers Association Player of the Year for the fourth time. Belmonte was a landslide winner in voting by the bowling news media (including myself) and his fellow competitors. 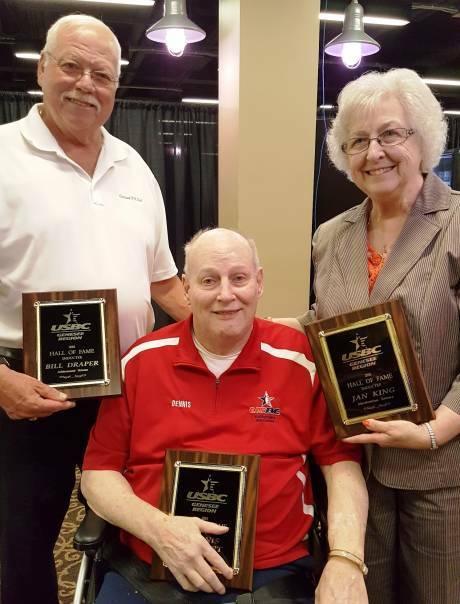 Other honorees are Matt Sanders of Indianapolis, as the 2017 Harry Golden PBA Rookie of the Year; Chris Loschetter of Avon, Ohio, as the Steve Nagy PBA Sportsmanship Award winner, and PBA Hall of Famer Del Ballard Jr. of Keller, Texas, as the recipient of PBA’s Tony Reyes Memorial Community Service Award. They will be recognized at the Go Bowling! PBA 60th Anniversary Celebration Dinner and Hall of Fame induction ceremonies on Saturday, Feb. 17, at the Indianapolis Marriott North. The entire celebration dinner will be live streamed on PBA’s online bowling channel, Xtra Frame. Belmonte is the first player in PBA history to win three major championships among his four titles in 2017. At age 34, he joins Mark Roth as a four-time winner of the award. Walter Ray Williams Jr. is the all-time leader with seven Player of the Year Awards, followed by the late Earl Anthony with six. Belmonte, the best two-handed player ever, led the PBA in earnings ($238,912) and scoring average (a PBA record 229.39 for 380 games bowled). The PBA World Championship title is his ninth major and was his third major victory in 2017, along with the Barbasol PBA Players Championship and his fourth United States Bowling Congress Masters. He now has won the Player of the Year award in four of the past five years, missing out last year when E.J. Tackett of Huntington, Ind., captured the prize. The United States Bowling Congress, in a continuing and more intensive effort to ensure bowler average integrity, is reclassifying more than 700 leagues to either the Sport or Challenge designation. According to a USBC press release, data compiled from bowlers who competed in multiple leagues during the 2016-17 season reveals that the lane conditions of 704 leagues nationwide were more difficult than Standard (or House) leagues. As a result, 605 leagues will now be reclassified as Challenge leagues and 99 will be reclassified as Sport leagues based on data that showed the scoring pace was significantly different from the scoring pace its members had on Standard league conditions. The averages of the bowlers in those leagues now will carry a Sport or Challenge designation on Find A Member on bowl.com. If they have no other average, the bowlers will need to follow Rule 201 and use the Sport or Challenge conversion charts when entering leagues or tournaments bowled on Standard conditions. I have not seen that any leagues in our area are being reclassified, but I believe that some in local halls with more difficult scoring conditions should be. I have seen that a few leagues in Rochester have been reclassified. Last year, the USBC bridged the gap between Sport and Standard leagues by introducing the Challenge league designation for leagues using tougher, though not Sport, lane conditions. Compared to Standard lanes conditions (house shot), bowlers in Challenge leagues have averages that are 10-19 pins lower than averages on a house shot. Averages in Sport leagues are 20 or more pins lower. A $1,500 guaranteed top prize awaits the winner of this scratch singles event, which features qualifying squads at 7 and 9:30 p.m. Friday, 11:30 a.m. and 2:30 p.m. Saturday, and 10 a.m. and 1 p.m. Sunday. A one-game “last chance” squad is scheduled for 4 p.m. Sunday, followed by eliminator-style finals. The entry fee is $70, with a re-entry fee of $50. One in five bowlers will cash. For more information or to enter, call 585-658-2540. Curt Haight Memorial 4-Person No-Tap, Mancuso Bowling Center, Batavia. A $1,000 first prize, based on 48 teams, is being offered at this annual handicap event conducted in memory of the late Curt Haight, who was an avid Batavia bowler. Squad times are noon and 3 p.m. The entry fee is $100 per team and one in six teams will cash. To enter, contact Matt Balduf at 585-415-2964 or Mancuso’s at 585-343-1319. First place is $600, guaranteed, and one in five bowlers will cash in this scratch singles tournament. Squad times are 1 and 3:30 p.m., and will be followed by a one-game “last chance” squad for those missing the cut. A head-to-head match play finals will determine the champion. The entry fee is $50. Call Medina Lanes at 585-318-4474 to enter. Rich Wagner's 300 game and Scott Kern's 299 were among the highlights in Genesee Region league bowling action for the week of Jan. 8-14. Wagner, a 35-year-old left-hander from Batavia, finished with a perfect game to post a 761 series in The North Pole league on Thursday night at Mancuso Bowling Center. Kern, 62, of Basom, started with a 299 (leaving a 5-pin on the last ball) en route to a 652 series in the Wednesday County Line Stone league at Scopano's Lanes in Oakfield. Other highlights ilncluded 700 series by two women in the G&W Vending League at Rose Garden Bowl in Bergen -- Caycee Landers' 706 and Laurie Morgante's 703. The 700 series is the first USBC-certified 700 series for Morgante. Kim Williams posted a 647 series in the Monday Night Ladies league at Mancuso's. For a list of high scores from the area, click on the Pin Points tab at the top of this page. 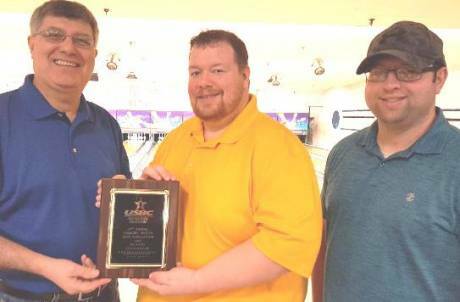 Scott Culp of Lima put on a dominating performance over the weekend to capture his second straight Genesee Region USBC Scratch Memorial Tournament title. The high-revving 39-year-old right-hander posted a wire-to-wire victory – leading both the qualifying and semifinal rounds and capping it with a 215-180 win over Jerry Blair of Le Roy in the championship match of the stepladder finals on Sunday at Letchworth Pines in Portageville. Using a Storm Crux, Culp, a 240-plus average bowler at Livingston Lanes in Geneseo, rolled 900 to place first in the four-game qualifying round and added 873 in the four-game semifinals to earn the top seed for the stepladder finals with a 1,773 total (221 average). Both rounds were contested on “Sport” oil patterns (considerably more difficult than “house” shots) – with the qualifying round rolled on Kegel Middle Road (39 feet) and the semifinals and finals on Kegel Route 66 (45 feet). The event drew 46 entries – down from the 69 that bowled when Culp won the title last year at Medina Lanes. The victory was worth $600 for Culp, while Blair earned $350. Blair moved up the ladder by defeating Brady Weber of Perry in a 10th frame roll-off, 20-9, after the bowlers had tied at 212-212; stopping Don Parrott of Warsaw, 215-176, and edging Kevin Gray Jr. of Warsaw, 220-214. In the semifinal match against Gray, Blair struck on the first ball in the 10th to secure the win. Gray won $260 for his third-place finish, while Parrott earned $210 and Weber $160. The five other finalists were Dana Freeman of Silver Springs ($150), Dean Cadieux Jr. of Oakfield ($140), Mike Pettinella of Batavia ($130), Ron Bacon of Warsaw ($120) and Brian Green of Batavia ($110). Parrott had the tournament’s high game (279), followed by Culp (278). The GRUSBC contributed $400 to the prize fund. Photo -- Scott Culp, left, and Jerry Blair. If you would like your league's weekly high scores to be published on The Batavian, send an email to [email protected]. Men's scores of 220 (game) and 600 (series) or better and women's scores of 190 (game) and 540 (series) will be posted. Photos of honor score bowlers or those with newsworthy accomplishments will be posted as long as they are emailed to the same email address. Putting the finishing touches on one of the most exciting PBA Tour television finals in the organization’s 60-year history, Australia’s Jason Belmonte defeated Jesper Svensson of Sweden, 238-225, for the PBA World Championship title. The finals of the tournament, which took place in November during the World Series of Bowling IX in Reno, Nev., were telecast last Sunday on ESPN. The victory marked Belmonte’s third major championship in 2017, setting a PBA Tour record, and was his ninth career major crown. It also virtually locked up another PBA Player of the Year title (voting will take place later this month) for the 34-year-old two-hander and added another $60,000 to his bank account. Furthermore, Belmonte moved into third place on the PBA’s list of all-time major champions behind PBA legends Earl Anthony and Pete Weber, who both won 10 majors. As far as the show itself, two matches were decided in sudden-death roll-offs – the opening match between Matt Sanders of Evansville, Ind., and Kyle Troup of Taylorsville, S.C., and the semifinal match between Belmonte and Cheektowaga’s Ryan Ciminelli. In the first match, Sanders and Troup finished in a 248-248 tie, before Troup struck in the extra frame to edge Sanders, who left a 7-pin. Ciminelli then topped Troup, 193-180, before battling Belmonte to a 257-257 tie. Unfortunately for the Western New Yorker, he left the 2-5-6 on his first shot in OT after Belmonte had left a 7-pin. Then in the title match against left-side two-hander Svensson, Belmonte got a break when he struck in the fifth frame despite the finger grip coming out of the ball. The match was close throughout, but Belmonte came through in the 10th frame with a pair of strikes to seal the deal. Svensson earned $30,000, Ciminelli $25,000, Troup $20,000 and Sanders $15,000. ESPN’s coverage continues at 1 p.m. this Sunday with the World Bowling Tour Women’s and Men’s Finals. Competitors are Malaysia’s Shalin Zulkifli, Danielle McEwan of Stony Point, N.Y., and Diana Zavjalova of Latvia, and Marshall Kent of Yakima, Wash.; Svensson and Belmonte. The local bowlers on the Beat the Champ TV show at Mancuso Bowling Center in Batavia ran into a “buzzsaw,” and were unable to unseat "the champ," Dana Voytovich of Cheektowaga. The show was taped on Nov. 29 and televised on Dec. 23-24 on WBBZ-TV (MeTV). Voytovich concluded a perfect month – running his winning streak to eight matches – by knocking off Batavian Rich Wagner, 268-213; Brockport’s Chris Bardol, 245-237, and Batavian Rob Stefani, 255-185. The victories enabled Voytovich to enter this month’s competition at Rapids Bowling Center in Niagara Falls as the champ. Those shows will be televised on Jan. 6, 13, 20 (repeated on Jan. 7, 14, 21). The fourth show from Batavia featured eight youth bowlers form the Turnbull Heating Junior League at Mancuso’s, bowling as boy-girl doubles teams. Emma Miller and James Townsend emerged victorious by defeating Corinne Saluste and Sam Miller in the final match. Miller/Saluste had advanced with wins over Samantha Balbi and Benjamin Sputore, and Tara Clattenburg and Skylar Laesser. All in all, the Batavia-area bowlers competed at a high level, and put on a good show for the viewers. Genesee Region USBC men and women bowlers have a chance to see how they measure up against the best in the association this weekend by entering the 64th GRUSBC Scratch Memorial Tournament at Letchworth Pines in Portageville. Qualifying squad (four games) times are noon and 3 p.m. on Saturday and 10 a.m. on Sunday. One in five from each squad will advance to four-game semifinals and, from there, the five bowlers with the highest eight-game total pinfall will advance to the stepladder finals. Two different oil patterns will be used -- the 39-foot Kegel “Middle Road” during qualifying and the 45-foot Kegel “Route 66” during the semifinals and finals. First place, based on 80 entries, is $1,000; the entry fee is $55 and re-entry is allowed. To enter, call 585-861-0404 or send an email to [email protected]. Other tournaments this weekend include the Scott Whittier Memorial three-person, no-tap on Saturday at Oak Orchard Bowl in Albion (squads are at 1, 3, 5:30 and 7:30 p.m.) and the 60-and-over Tour at noon Sunday at Mancuso Bowling Center in Batavia. While one hopes that all tournaments are successful, having two other events the same weekend as a major GRUSBC tournament forces bowlers to choose – and that’s not a good thing. Since the GRUSBC schedule is out before the season begins, it shouldn’t be difficult for promoters of other tournaments to avoid any conflicts. It’s simply a matter of common sense and working together – and that’s something to remember when setting up tournaments for 2018-19. -- Kevin Gray Jr. of Warsaw captured the $700 first prize at the Domm’s Christmas Eve Sweeper at Domm’s Bowling Center in Rochester, rolling a 300 game during the qualifying round and surviving through three eliminator rounds. Other GRUSBC bowlers cashing were Tom Rohl of Le Roy, Rob Husted of Spencerport and Scott Gray of Warsaw. -- Lefty Bob Santini opened the New Year with a bang by rolling a perfect game – his second of the season – in the Monday Night Merchants League at his (he’s the proprietor) Mount Morris Lanes. Santini now has 11 USBC-certified 300 games. And on Tuesday night, Dave Emler of Rochester rolled a 300 game and 759 series in the G&W Vending League at Rose Garden Bowl. -- Matt Slocum of Perry and Curtis Foss of Medina cashed at the Mike & Ruth Rose New Year’s Day scratch tournament at Bowl-A-Roll Lanes in Rochester, with both bowing out in the early rounds of the finals. PBA standout Brad Angelo of Lockport pocketed the $1,500 top prize, rolling a 299 game in the title match. -- GRUSBC directors welcomed Steve Krna of Alexander to the local association board at their meeting last Saturday. An avid league bowler, Krna is president of Genesee Patrons insurance Cooperative Insurance Co. in Batavia. The board voted to bring back the GRUSBC Invitational tournament, a 64-bowler “by invitation only” handicap singles event, and tentatively scheduled it for Sept. 29 at Mancuso Bowling Center. Also, the board is accepting nominees for the GRUSBC Hall of Fame through Feb. 1. Nomination forms can be found at www.bowlgr.com. -- Following a successful first half of its first season, the Sunday Roll-Offs league at Medina Lanes is gearing up for its second half, starting this Sunday at 10 a.m. The format of the USBC-sanctioned handicap singles league is three games of qualifying with bowlers divided into groups by their averages. Winners from each group then bowl one more game to determine the weekly champion. Additionally, points are awarded each week, which are worth prize money at the end of the season. The weekly fee is $20. For more information, call Medina Lanes at 585-318-4474. -- The Genesee Region Youth Travel League reached its halfway point last Sunday at Mancuso Bowling Center and the Rose Garden I team from Bergen continues to hold a 12.5-point lead over second place Batavia Strike Force. Weekly leaders were Josiah Yantz of Scopano’s Lanes with a 234 game and 660 series, James Townsend of Batavia Strike Force, 222—638; Ben Lennox of Oak Orchard I, 233—617; Paige Snook of Oak Orchard I, 192—554; Corinne Saluste of Strike Force, 205—554, and Logan Cadieux of Scopano’s, 177—476. The league bowls again on Jan. 21 at Rose Garden Bowl. -- The GRUSBC Adult-Junior Doubles Tournament is set for Jan. 12-14 at Mancuso Bowling Center, with squad times at 7 p.m. on Jan. 12, and noon and 3 p.m. on Jan. 13 and Jan. 14. Competition will be in two handicap divisions -- based on youth bowlers ages: 12 & under and 13 & over. The entry fee is $40 per team. To enter, contact Tom Fluker at [email protected].